Leading Exporter of flour mill stones from Rajkot. 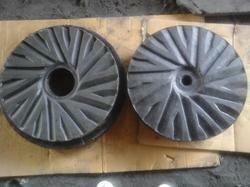 Horizontal Mill Stone is exclusively manufactured by Natural materials with oxychloride process. The Heavy Duty Stones bolted on is bolted on the casting and the runner stone is fitted on the shaft. Manufactured by high quality syncroshaped Abrasive grains having hardness about 8 on Moh's scale with both black bonding & white bonding.